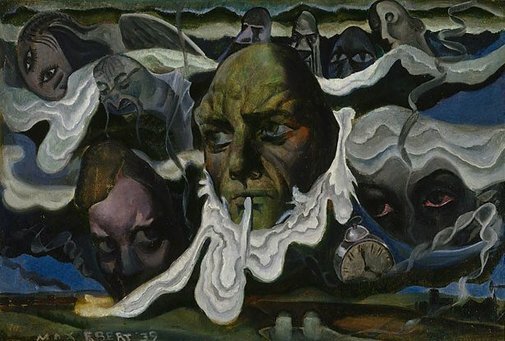 The painting portrays many people awakening in the morning hours of a city’s life; the white surf of their consciousness riding the crest of the vast waves of the mind’s sea as it breaks upon the sands of the morning; and the first objects of the real world – alarm clocks, breakfast trays, trains to be caught – impinge upon dreams and bring an awareness of the passing of time. Something of the illimitable reaches of the mind, and its retention of not only infantile experiences, but also age-old remnants washed up from the ocean-deeps of man’s existence as a social being, are indicated by the strange negroid and Easter Island-like statues that stand beyond the crest of the farthest waves; islanded in the waters of a dream-world, from which men sail back downwards to consciousness and the necessities of a new day. Signed and dated l.l. corner, beige oil "MAX EBERT 39". Unknown, Bauhaus on the Swan: Elise Blumann, an emigre artist in Western Australia, 1938-1948 , Crawley, 2015, 52 (colour illus. ).